As the old adage says, to develop true empathy you should walk a mile in another man’s shoes. When understanding risks posed in day to day work, a number of clues can often be hidden in the footwear you find yourself wearing. When I say the words ‘working uniform’, what first springs to mind is probably not what you wear on your feet. Clothing such as safety glasses, hard hats and high visibility vests are all more visible items worn to reduce the risk of injury, with footwear often a mere afterthought. Still, businesses are required by law to have health and safety measures in place to ensure their employees are protected from injury anywhere on their bodies. This has all been formalised in health and safety guidelines pertaining to personal protective equipment (PPE). An employer has a legal duty of care to safeguard their employees while they work. As such, they are obliged to carry out a suitable risk assessment for all working activities. The risk assessment should be all inclusive and should take into consideration the task at hand, the working environment, the working materials, the tools being used and the suitability of those carrying out the task. Such an approach will help to determine the measures that should be taken to ensure the safety of those working. Any hazards present should be identified, with potential dangers analysed so that solutions can be sought. This will help to identify the protective footwear needed, with defensive features to suit the working environment. It is crucial that a risk assessment considers the way in which work will change over time. While PPE may not be deemed necessary from the outset, associated risks may emerge as the work progresses. 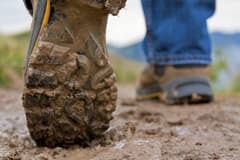 While the need for protective footwear may become more pronounced, it is equally possible that it may no longer be required. By accounting for all risks, employers will ensure the safety of their workers for the duration of the work. While PPE is important, the law is clear that the root cause of health and safety issues should be tackled prior to dishing out PPE. In some situations, for example, repairs to leaking equipment may remove the need for safety footwear, thereby tackling the problem at its cause rather than introducing an ad hoc solution as a contingency. Where there are unavoidable issues resulting from the nature of work to be completed, solutions should be found through PPE. The following sections are hazards that would call for personal protective footwear. Falling and moving objects don’t just pose the risk of head injuries. Their impact can also easily break a toe, which can restrict an employee’s ability to work. It is crucial that employees are protected should anything drop on their feet. This is especially true for those who work in industries where heavy materials and equipment are being handled every day, such as in manufacturing and construction. Capped with strong material to keep the toes safe from accidents and mishaps, steel toe boots are the most popular risk minimising option. As well as considering risks from above, hazards on the ground should also be taken into account. Punctures can be as damaging as any forceful impact and where necessary safety footwear should protect the foot in its entirety. This is of particular importance for those who work around sharp and pointed objects such as loose nails, metal and smashed glass. Metal instep footwear can prevent sharp objects from penetrating the feet, thereby avoiding injury. While punctures can be incredibly painful, it is not just the wound that does damage, but also any resulting infections. Rusty nails, for example, can be particularly dangerous and if they penetrate the skin medical attention should be sought. To help prevent infection, wounds should be kept clean and dry. Anyone working around these dangers should also be vaccinated against major risks such as tetanus. Wearing the correct protective footwear that successfully guards the sole of the foot can help to avoid injuries in the first place. The correct boots should also protect from extreme and hazardous temperatures. This is especially crucial for those working outdoors. The correct foot protection should adapt to changes in the environment. Where drops in temperature are concerned, as is expected of other garments, work boots should keep the wearer warm. This is often dictated by the quality of materials used and as such can increase the cost of the footwear considerably. Wearing insulated footwear, however, can ensure productivity doesn’t suffer as the weather becomes colder. With that in mind, the correct boots can be considered a valuable investment. Other working environments dictate the need for protective footwear that can safeguard against extreme heat. In some industries where the worker may be at risk of burns, adequate protection should minimise such hazards. Risks include exposure to chemical or molten metal splashes, flammable or explosive atmospheres and fire. In particular, fire fighters require boots that can adapt easily. Often, high quality leather or rubber is used to make their footwear, ensuring protection is reliable - regardless of the elements. You too could follow suit if you feel there may be a comparable risk in your workplace. Whether an employee works indoors or outdoors, there is a chance that they may be exposed to a wet environment. With rain, hail and even snow to contend with, footwear must be equipped to excel in such conditions. Water resistant work boots are a popular choice, ensuring the foot remains dry regardless of conditions. As another important consideration where water is concerned, care should be taken to ensure footwear is slip resistant. Particularly important in industries where spillages are common, the sole should grip firmly, regardless of wet or greasy conditions. The dangers of slips are well publicised, with potential injuries spanning the entire body. While employers do have a responsibility to minimise leaks, durable, traction-supported shoes can prevent accidents where spillages have slipped through undetected. Employees working with electricity require protective footwear with a specially made sole that helps to reduce the potential of an electric shock. Using the correct protection will help to protect employees when they are exposed to wiring, high voltage circuits and other forms of electricity. Electric hazards can be common and may be the cause of serious injuries such as burns. In extreme circumstances, electric shocks can be of sufficient voltage to kill. Protective footwear with non-conductive soles can mitigate these risks, protecting the health and wellbeing of employees. As outlined previously, there are numerous dangers which make protective footwear a necessity. Wherever such risks to health and safety are present and they cannot be adequately controlled for in other ways, the 1992 Personal Protective Equipment at Work regulations (PPEW) require that the relevant PPE is supplied. The PPEW guidelines require that PPE is properly assessed before use to ensure it is fit for purpose. This may be best determined as part of the thorough risk assessment detailed earlier. Being fit for purpose is one thing, but properly fitting the employee who is to use it is quite another. It is crucial that shoes fit properly, moreso than for any other item of workwear. Feet vary in terms of size, shape and width from person to person, meaning that footwear which suits one person just fine can be unbearable or dangerous for someone else. While wearing PPE is in the employee’s best interests, poorly fitting footwear can cause numerous problems. Conditions such as calluses, ingrown toenails and fungal infections are particularly prevalent among workers who wear badly fitting safety shoes. The resulting discomfort, pain and fatigue from these conditions can cause further injuries to the muscles and joints. Having employees in pain or discomfort may also cause a detrimental impact on productivity, which will, of course, have long term repercussions for any business. It is therefore crucial that thought and consideration are put into any footwear purchase. Where employees are working outdoors in bad weather, for example, it is imperative that the boots are well insulated to keep their feet warm. There is, however, a balance to be struck, as too much added bulk would make shoes uncomfortable. To counter this, employers should ensure that any footwear purchased is fit for purpose, neither exceeding nor falling short of its requirements. As for PPE, it is important that any protective item is properly assessed before each and every use to ensure its continued fitness for purpose. Proper maintenance and storage will prolong the lifespan of protective footwear. It is important to note, however, that depending on the type of footwear a replacement may be required after a set period of time. Regular checks should be undertaken to determine when these will be necessary. Employers also have a responsibility to provide their workers with thorough training, ensuring they understand why PPE is required and how it should be used. Often issues surrounding PPE are rooted in a lack of knowledge, and as such it is best practice for employers to presume naivety on their employees’ behalf. Taking a back-to-basics approach, while unnecessary for some, is the best way to ensure comprehensive understanding throughout the whole workforce. What if an accident does happen? Where accidents occur and injuries are sustained because of a failure to provide PPE, the cause can be attributed to employer negligence. Most workplace injuries and fatalities are caused by a lack of appropriate equipment and training. Employers are legally obliged to provide both. As an example, in a situation where a worker is exposed to a live electric current, a failure to wear non-conductive soles can lead to an electrocution. Despite the well-documented legal requirements placed upon them, there are unfortunately many employers who still fail to comply with current health and safety legislation. Some employers might avoid giving out protective equipment, while others may neglect to train their staff thoroughly. This kind of negligence occurs because employers put their time and money before the lives of their employees. Ironically, when accidents and fatalities inevitably happen as a result, the same managers will usually spend much more time and money trying to settle the damages caused. If an accident has taken place and negligence can be proven, the individual who has suffered would be well placed to make a claim for compensation. Speaking on the risks relating to inadequate foot protection, Stephen Mansfield, a serious injury solicitor, said: “When getting ready for work, we get ready for the day ahead - the shoes we put on play their part. In extreme circumstances, footwear protection can be the difference between life and death and employers should take note. “It is easy for an employee to presume that an employer will be aware of the risks posed to them and act in their best interests. Unfortunately, throughout my career I have time and time again seen cost cutting measures take priority over safety and wellbeing. Many personal injury claims I see could have easily been avoided had health and safety fundamentals been clearly defined and understood by both the employer and the employee. It is better to have such measures in place than to regret their absence after what could be a serious and debilitating accident. Workplace accidents can all too often be painful, traumatic, frustrating, and even, in some cases, debilitating. Whatever the injury, it is likely that time off will be needed to recover, which can result in a substantial loss of income. Victims may also suffer negative psychological symptoms from being let down by a trusted employer, and may even wrongly blame themselves. The compensation awarded from a personal injury claim can help to mitigate any loss of earnings, while paying towards necessary medical treatment, ensuring that the injured worker can achieve the full and healthy recovery they deserve. Although employers should be concerned about safety and put practices in place on their employees’ behalf, workers are advised to check the security of these measures for themselves. Although it may take some time to learn the health and safety guidelines specific to a specialist industry, it is always a sound investment. Nothing should be of higher priority to anybody than their long term health.